Jim Zimmerman and his daughter, Shelby, hunt a creek bottom in Gregory County. Teenagers who help at Louise’s Cafe in Fairfax, population 115, are about to get a lesson in communications. That’s one of several side benefits to the hunting season for Gregory County, in the heart of pheasant country. Marge LaFave has run the tiny and impeccably clean Hertz Motel in Bonesteel, population 100, for nearly 40 years. 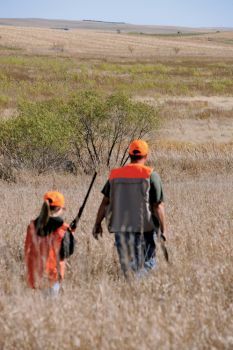 Even though most of the pheasants have migrated west of her little town, hunters still sleep there. Across the street is the historic TeePee Cafe, managed by Tami Jons who features Friday night steak specials, prime rib on Saturdays and Sunday breakfast buffets. The motel and cafe were built in the 1950s in anticipation of the lake traffic everybody thought would flood Highway 18 once Fort Randall Dam filled Lake Francis Case. Walleye and anglers have taken to the lake, but ring-necked roosters take precedence in October when the sorghum heads turn red and the sumac even redder. Pheasants are a $250 million industry statewide. More than 170,000 hunters will be gunning for the birds this fall. That creates 4,500 jobs for guides, taxidermists, waiters, bartenders and lodge-keepers in the four very small towns (Fairfax, Herrick, Bonesteel and Dallas) and two small cities (Burke and Gregory) that comprise Gregory County. Churches hold bake sales to capitalize on the hunters, and the city of Gregory celebrates with a soup-tasting contest. Opening Day has a fresh aura, especially in Gregory County where an autumn blue sky is beautifully framed by the muted, earthy colors of cornfields, grasslands and tree belts. Hunters regularly remark that they wouldn’t care if they never saw a pheasant, so lovely are the landscapes. “It’s more about the relationships and the camaraderie,” says Mike Karbo, who bought the funeral home in Burke 20 years ago and moved from Sioux Falls because he loved the outdoors. He says deer, turkey and walleye are also big draws.